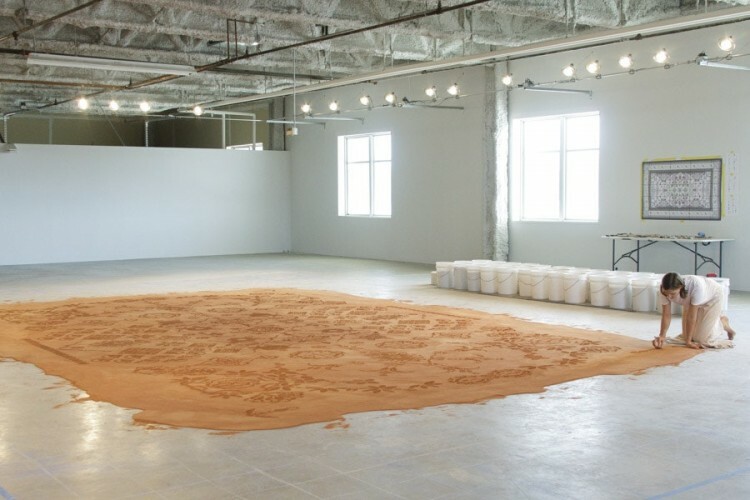 'Red Dirt Rug Monument' by Rena Detrixhe at Western Michigan University - Grand Rapids was selected by both the public and jury to move on to Round 2. Following the first round of voting, ArtPrize visitors have selected the twenty finalists, five entries from each category, that will join the Category Jurors’ picks with the chance of taking home $500,000 in cash prizes. GRAND RAPIDS (Michigan) October 1, 2017 — ArtPrize, the international art competition recognized as the world’s largest annual public art event, today revealed the visiting public’s top picks for the ninth annual event at the Public Vote Final 20 Announcement presented by Consumers Energy. These twenty artist entries, selected over the past 11 days of the Public Vote presented by Meijer, will move on to Round 2 alongside the Category Jurors’ twenty picks, announced last week. These forty artist entries continue with the chance of winning $500,000 in prizes, including two $200,000 Grand Prizes and $100,000 in Category Awards. This year marks the fifth anniversary for SmartArt — the art competition which blends art with sustainability and environmental stewardship. Consumers Energy teamed up with Grand Rapids Public schools and ArtPrize to once again give high school students the opportunity to create art with a renewable energy theme. Students competed for a $1,000 college scholarship, for the opportunity to have their artwork on display at the JW Marriott during ArtPrize Nine, and more. At today’s Final 20 Announcement event, Consumers Energy revealed the 2017 student art competition’s top winner, ‘What Makes the World Go ‘Round’ by Katelyn Sheneman. ArtPrize visitors will once again have the opportunity to voice their opinions and decide the winners of over $200,000 in prizes. Round 2 Voting will begin at 2 p.m. EDT today, October 1 and will run through October 5 at 11:59 p.m. EST. Visitors can cast up to forty votes, one per finalist and ArtPrize encourages visitors to consider voting for at least one entry in each category. The winners of both the public and juried awards totaling $500,000 will be announced at the Ninth Annual ArtPrize Awards Ceremony, presented by the DTE Energy Foundation, on October 6.